We now have a little more information about Bay Oval, and what it's all about. We also have seen both teams play. And really, we don't actually know much more. Here are some things that I noticed, and some battles to look forward to. 1. Trent Boult vs Quentin de Kock. de Kock is a good batsman, in good form, but he looked somewhat clueless against Boult, and it looks like he will need to develop a better plan as to how to bat against him. 2. Vernon Philander vs Martin Guptill. Guptill looked completely out of form in the first game, but that's at odds with how well he played in the CPL just recently. Often a batsman looks out of form when a bowler is bowling in places that makes it difficult for him to score. I think that is what actually happened in the first match. It will be interesting to see if Guptill has managed to figure out how to get some runs off Philander's bowling. 3. Kyle Mills vs Hashim Amla. If Mills plays in this match, it will be interesting to see if he can repeat the dose against Amla. Mills bowled 21 deliveries to Amla, and he managed to only score 12 before getting out. And those 12 mostly came from streaky, un-Amla like shots. Conventional wisdom would say that Amla's too good to repeat that performance, but Mills is a very crafty bowler, and his successes against Chris Gayle say that he is capable of targeting a player and really getting on top of them. 4. Brendon McCullum vs Morne Morkel. McCullum backs himself to dominate anyone, but he has always found Morkel a difficult bowler to face. Morkel got him in the first match, and McCullum will not want a repeat in the second. 5. Jimmy Neesham vs Dale Steyn. Steyn will be particularly grumpy with the way that Neesham approached their confrontation in the first match. Neesham didn't look phased by the great bowler at all. It will be interesting to see what lengths Steyn bowls to him today. There were non in the first match, but there were 3 close calls, and that was without the sort of scoreboard pressure that normally brings about run outs. McCullum sets fields trying to get run outs, and ABdV has been working hard on getting the South African fielding back to where they were in years gone by. de Villiers has a phenomenal record in the second match of a series. Over the past 3 years he's only had 2 times that I could see that he's hit less than 50 in the second match in a series. He's hit 3 centuries and 2 not out fifties. He's also got the wood on most of the New Zealand bowlers. 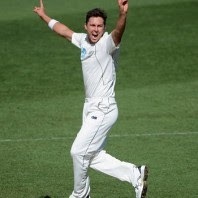 Latham looked fantastic, and would have been likely to got a big score other than a piece of bad luck against Duminy. I think opening against a line up featuring (at least 2 of) Mills, Southee and Boult is a very difficult prospect. New Zealand are a better team than they showed in the last game. Look for a big step up. All odds are from NZ TAB and are accurate at time of writing.